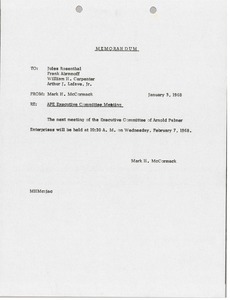 Cleveland (Ohio) - Memorandum announcing an Executive Committee meeting. 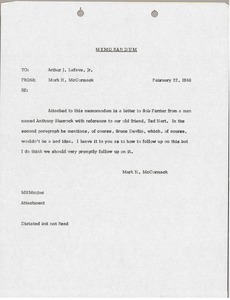 Cleveland (Ohio) - Borglund forwards Lafave a cartoon of Murray Olderman that he thought McCormack may enjoy. See also mums700-b0001-f014-065. 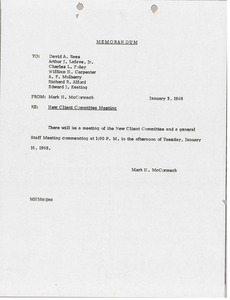 Cleveland (Ohio) - Memorandum announcing a new client committee meeting. 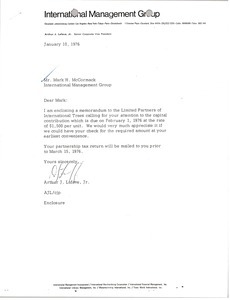 Cleveland (Ohio) - Lafave sends a memorandum written to the Limited Partners of International Trees regarding the capital contribution due. 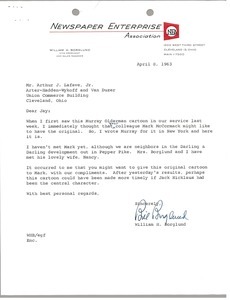 Cleveland (Ohio) - Memorandum regarding a letter to Bob Ferrier from Anthony Sharrock referencing Ted Hart and Bruce Devlin. 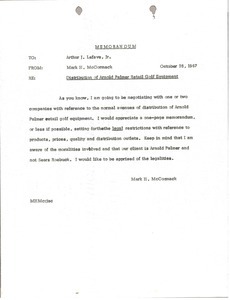 Cleveland (Ohio) - Memorandum from McCormack regarding keeping Bridgestone and Kanda out of Esso negotiations and communicating that Bridgestone has no further rights to Arnold Palmer golf ball. 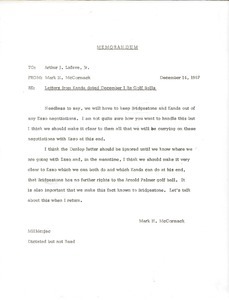 Cleveland (Ohio) - Memorandum from McCormack to Lafave regarding distribution of Arnold Palmer retail golf equipment.